When you need just the right size. 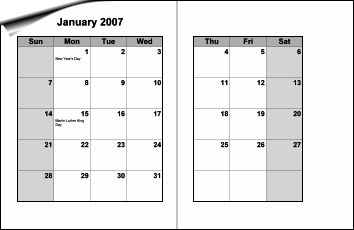 A monthly calendar spread out across two pages. 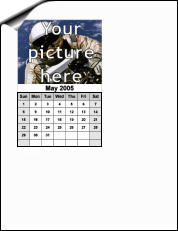 This monthly calendar has room for your own picture and fits into a 5x7 frame. 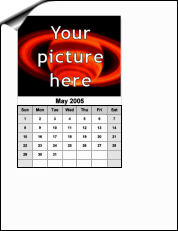 This monthly calendar has room for your own picture and fits into a 4x6 frame. 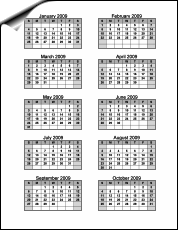 Carry this handy six-month calendar in your wallet or purse. 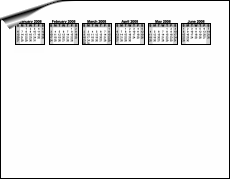 Contains the next six months in a horizontal strip. 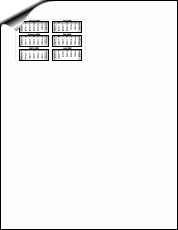 Ten months to fit onto a business card sheet. Don't want clients to throw away your business card? Put a calendar on the back of it!